The February issue of Art in America features a Ross Simonini interview with Richard Aldrich in which the artist discusses the notion of artistic progress. Here is an excerpt in which Aldrich deflates the traditional idea that an artist makes formal progress over the course of a lifetime, embracing a “stylist non-progression.” I agree completely. Richard Aldrich, Untitled (Anthropomorphic Collage), 2007, wood, tape and faux fur on canvas 36 x 23.75 inches. SIMONINI Do you care about the notion of progressing as an artist? ALDRICH I like how, in the book Bortolami published in 2013 [Richard Aldrich], the paintings are from 2003 through 2012 but they look as if they could’ve been done at the same time. So in many ways, I’ve prided myself on this stylistic non-progression, which isn’t the way history normally determines how “artistic progress” should look. For instance, the Mondrian room at MoMA. The museum presents a chronological walkthrough of his art: trees, trees that are really straight, trees that form a grid. Then there’s this aha moment: it’s just an abstract form, it’s not a tree anymore, and we have “Mondrian.” I mean, I like Mondrian, but if the progress is not in formal development, then where do you locate it? There’s a way that my art always looks the same, but what’s progressing is an understanding of how paintings can exist or interact, how they relate to each other and to our understanding of history and how history is determined. To me, that interaction was always the thing. It’s about seeing things not in a linear way, but in an elliptical way. And that is the point of the college book. Like these four paintings here [Mix Tape List, Beatles Beatles Beatles, Portrait of me by Elizabeth Czeckner and My Mom’s Kitchen Wallpaper], which I either made in college or which incorporate images from that time. Each of the four comes from a separate place that’s very personal. One place is the songs from a mixtape I made for a girlfriend, one is another mixtape for the same girlfriend, one is a drawing from a different girlfriend and one is my mom’s wallpaper. They all come from important women in my life. When we see them all together, the experience is less about the individual paintings and more about the presentation of different images and the psychological states these images imply. SIMONINI Imply for you, or for someone looking at it? SIMONINI You think the two views are the same? ALDRICH They’re different things, but they’re both important. For me, painting is a way of working out my thoughts. For a viewer, it is a way of understanding different methods of organizing information. All information: visual, historical, everything. There is a certain kind of extrapolation that happens. Initially, the point is the painting itself, the image that is on it; then the point becomes more about the four paintings together as a group; now, with this book, the point is understanding them in relation to this gesture of “a book of work from when I was in college.” It’s about a way of understanding how an experience can shift and have different meanings when seen through different contextual lenses and temporal lenses. It’s like the movie Rashomon, except instead of depending on four perspectives from four different people, the understanding of the paintings comes through four different contextual shifts…. It’s like the end of The Usual Suspects where the cop realizes the whole story he’s just been told is a giant fabrication and it’s all based on things attached to the bulletin board that’s behind him. “Oh, that’s the missing book from the special editions.” Or, “Oh, that’s an image of the painting that was in that other show.” It can be very opaque, but there’s this potential for things to be put together. It can actually be quite easy to do so in some cases, but it’s certainly not essential for these links to be made. It’s more about the theoretical potential. This idea of information feels connected to the contemporary world. That’s something I like to play with: how information relates to the work and how and when it becomes available. 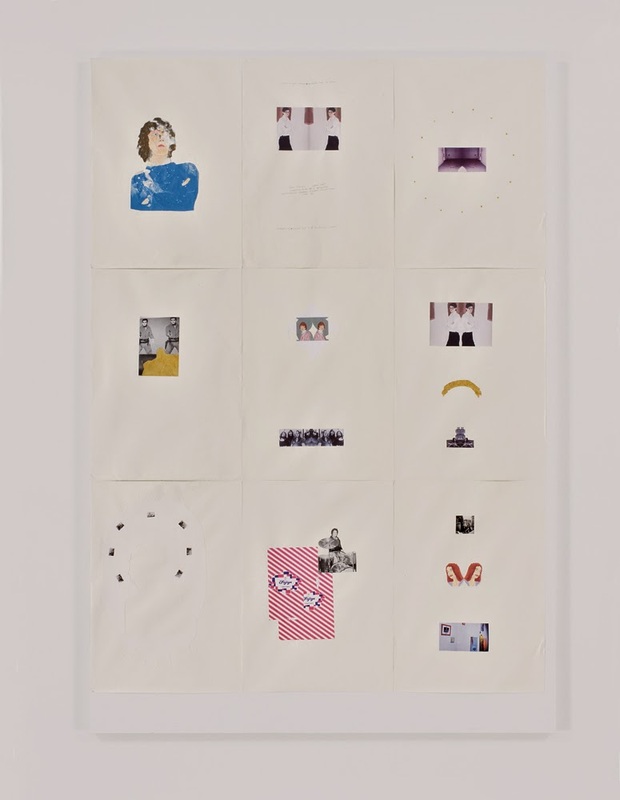 Richard Aldrich, Narrative with Syd Barrett, Robert Smithson, John Cale, Patty Waters, Daan van Golden, Richard Aldrich and Can, 2003-08, collage on linen, 84 by 58 inches. 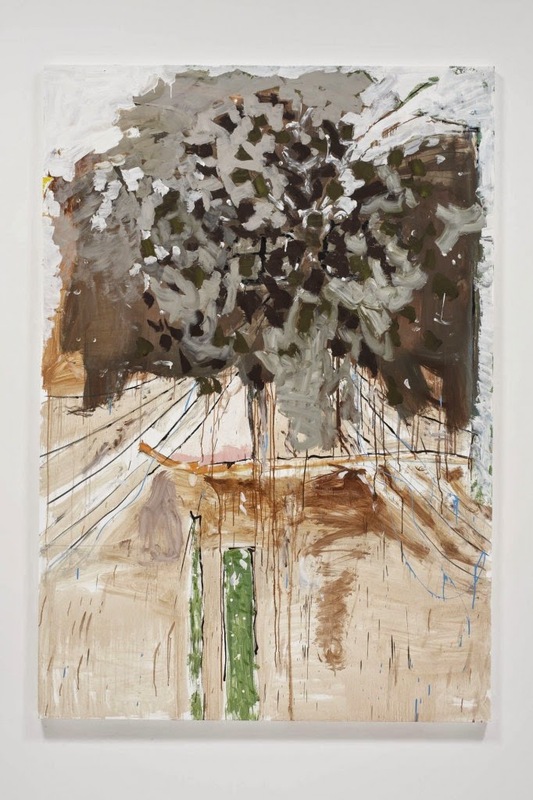 Aldrich’s paintings are on view in “The Forever Now” at MoMA through April 15, 2015. "There's a way that my art always looks the same…" Well, maybe for him, but the pieces shown here do not look at all the same. Come now, this reads like gallery talk? We stay and we stray, Rich got it! Alan sez: We stay and we Stray, Rich got it right! A classic demonstration of why to disregard artist's statements (written or spoken). Duh! Rick discovers context and supposes this is unrelated to process or progress.